Paneer or Panir is a fresh cheese common in South Asian cuisine and is of Indian origin. In eastern parts of India, it is generally called Chhena. It is an unaged, acid-set, non-melting farmer cheese or curd cheese made by curdling heated milk with lemon juice or other food acid. 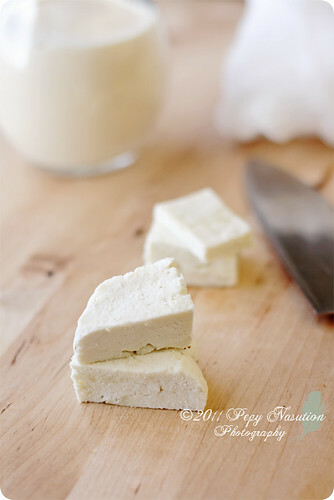 The process of making paneer is similar to tofu. It’s pretty easy to make and cost me cheaper than buy at stores. I have decided to make after watching Spice Goddess show on Food Network Canada. It’s not only South Asia nations have a tradition to make a fresh cheese, so does the Southeast Asian nations. In Indonesia, there are two places that I know making fresh cheese from water buffalo (kerbau) milk. It’s called “Dali” in North Sumatra and “Engke” in South Sulawesi. Both Dali and Dangke are coagulated with papain enzyme that is made from the juice of papaya leaves. The Filipino also has the version of water buffalo soft cheese and it’s called kesong puti. After you’re making your paneer, you can always cook it for other dishes. Thank you to Soma of ECurry who is very kind to let me linking some recipes of hers such as paneer makhani (butter paneer), malai kofta (cheese dumplings simmered in a creamy sauce), and sandesh (cheese fudge). You might be interesting to make pakora (South Asian fritters). 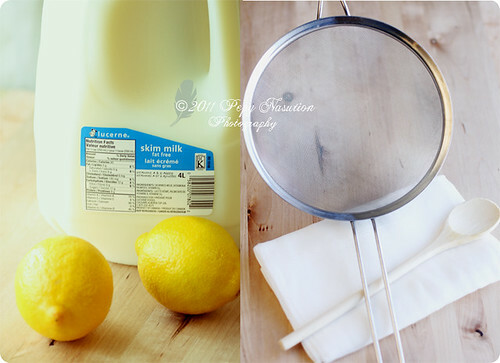 Add lemon juice and stir until the mixture separates into solids and liquid. Drain the mixture through cheesecloth set in a large mesh sieve (strainer). Wrap the ends of the cheesecloth around the curd and put a heavy weight on it such as a cookie jar or rice container. Let the water drain completely for 20 mins or even better, at least one hour, or overnight for a firmer paneer. To keep paneer remain fresh & soft for long, keep it wrapped / covered with wet muslin cloth in a air right container in fridge. As refrigerator works on the principle of dehydration it tends to dry everything thats kept in it, wet fabric wont let the dough/ paneer dry. Hence it remains soft for a longer period but don’t keep paneer more than 4-5 days. Sorry, I see you mentioned papain. Do you have any idea how to make that? I’m in an area where rennet is impossible to get, and I’d hate to get the recipe wrong. Do you read Indonesian? If you do, I can give you the link. Terima kasih banyak, teman! Informasi ini akan saya meneliti.